Don't let chlorine keep you out of the pool. camera (Getty Images) Don't let chlorine ruin your pool time. Chlorine is used as a disinfectant to kill harmful bacteria in the water. This keeps you from getting sick from E. coli and other nasty germs, but it also strips out the natural oils that protect your hair from damage and daily wear. Since I don't want my hair to turn into hay, I've learned to coat my strands with hair product before I jump into the pool. Oil and silicone-based products are best. I've used silicone-based hair serum, the type meant to calm frizzies and protect hair from heat-styling. Another option is coconut oil, which also delivers shine and moisture to my parched locks. Other products on the market are designed particularly for this problem. I'm currently using Phyto Plage Protective Sun Veil $22). It contains castor oil, and protects hair from the damaging effects of sun, salt, and chlorine. Some swimmers reek of pool chemicals even after showering and moving on to other activities. This is because chlorine chemically bonds to hair and skin, so you may need more than plain soap and water to wash it out. You can buy a specialty shampoo designed to get rid of chlorine and mineral deposits like copper, which can turn your hair green. I've used a product called Trimswim ($11), and it makes my hair feel soft while adding volume. It smells of citrus, which also helps remove the scent of chlorine. Malibu Swimmers Water Action Wellness Shampoo ($12) is another option. It doubles as a body wash and is gentle enough to use every day. It's cost-effective to use apple cider vinegar, which acts as a natural clarifier. Just add one part vinegar to four parts water and pour it over freshly washed hair. Then, do a final rinse. You can also mix up a Citrus Lift for your parched locks. The carbonation in the club soda and the acid in the citrus juices work together to detox your hair and remove impurities like dirt, chlorine, and salt. If this sounds like too much work and you're not the DIY type, you can get concentrated vitamin C in a bottle from SwimSpray. I've tried this product and while it hasn't been very good for my hair, I've found it to be a quick and easy way to zap the stink out of my swim gear. 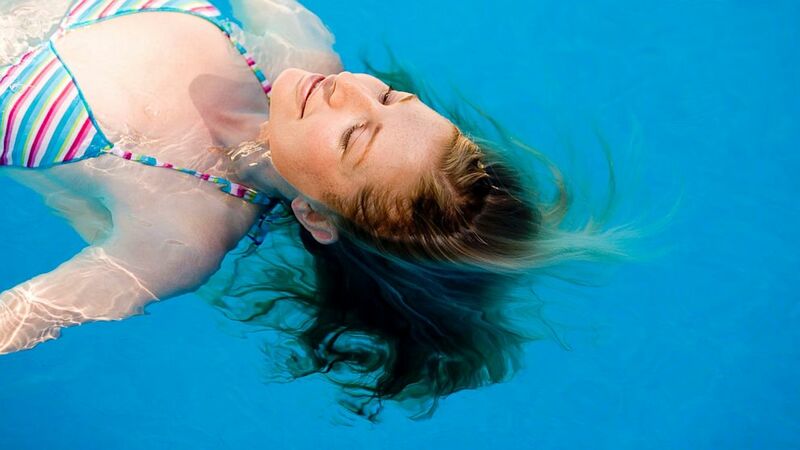 If you stay in the pool for too long, you'll get dry, chalky skin, and sometimes a red, itchy rash. The culprit again, is chlorine, which strips away the surface layer of oil that usually locks the moisture into your skin. You can't do much about it in the water, but once you exit the pool, go straight to the shower, take off your suit and flush the chemicals out of your skin with plenty of soap and water. If you have sensitive skin or the pool happens to be highly chlorinated, you might want to use a specialty body wash ($11) and lotion ($11) from Triswim. They work together to neutralize chlorine, remove odors and add moisture to the skin. Frequent swimmers know that chlorine can damage not only your skin and hair, but also your swimsuit. In time, the fabric will shred, the color will fade, and the elastic will break down. It can also turn your white suit yellow. The next time you shop for a new swimsuit, it's a good idea to check the tag to see if it is chlorine- and fade-resistant. A high spandex content is a plus, since it will help your suit keep its shape. You can also check for a satisfaction guarantee. Lands' End has this policy, and it covers all of its swimwear. Here's a final tip. Adding a few tablespoons full of vinegar to your wash will help neutralize chlorine, eliminate the smell, and even stop discoloration. If you're willing to splurge, you can buy a specialty detergent like Summer Solutions Suit Solutions ($8). A little goes a long way. I like to pour two small capfuls into a gallon-size ziplock bag with an expandable bottom, and bring it with me to the pool. When I'm done swimming, I'll pop my suit into the ziploc, fill it with water and swish it around a couple of times. Since it has a wide bottom, I can let the bag sit while I shower and get dressed. Then I'll empty out the water and rinse out the suit before I take it home. It's an extra step that I have to add to my routine, but it saves me from having to walk home with a tote full of wet swim gear that reeks of chlorine.